The Art of Mentoring is an experiential training for parents, mentors, grandparents, teachers, environmental educators, healers, community members and leaders, naturalists, peacemakers, ecological designers, and many more. This weeklong workshop offers tools to deepen and enrich your relationships with yourself, nature, family, and community. Guided by a team of experienced facilitators from throughout the Northeast, participants come together to experience a joyful and engaged learning community. 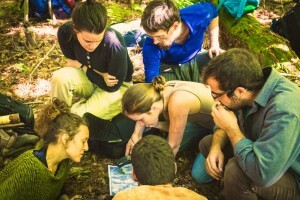 You will walk away with tools and embodied practices of regenerative community design, mentoring techniques, deep nature connection. Our hope is to inspire you to create healthy nature-based communities right in your own backyard! The week is a blend of experiential exercises, lectures, storytelling, music, nature exploration, and group activities. We will be both indoors and outdoors throughout the week. The skills and practices you will learn at the Art of Mentoring have been honed and put into practice by thousands of families, neighborhoods, and mentoring initiatives throughout our international network of over 300 affiliated schools and programs. These tools have also been incorporated in other community and professional settings, including public and private schools, universities, businesses, mental health practices, and more. For over twenty years people have come to the Art of Mentoring to be trained in our methodology for structuring and facilitating nature-connection educational experiences. The Nature Mentor Training Option provides that training. Guided by experienced mentors, facilitators, and trainers, participants will learn the fundamentals of the time tested mentoring maps and models we use to set ourselves, and our students, up for a lifetime of personal and community resiliency, based on the premise that we are all an essential part of the natural world. This option is typically attended by people who are in a formal mentoring or facilitation role (such as teachers, parents, social workers, community organizers, etc. ), or who want to adopt an Art of Mentoring framework in their organization or home, but it is open to anyone. Imagine going to a summer camp embedded in an intergenerational nature-based culture where the counselors are eager to help you deepen your connection to the earth in an embodied and playful way. This year for the first time we are offering new participants this immersion experience. You’ll be introduced to a range of practices and skills, facilitated by experienced mentors, that are designed to help you connect with the land and the other members of your group. This option will overlap at times with the Nature Mentor Training Option, but will skip the in-depth training components and head outside instead. 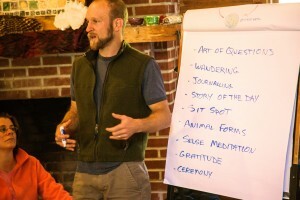 If your interest in coming to the Art of Mentoring is more about experiencing a nature-based culture and deepening your relationship to the natural world with other people— and less about learning the mentoring practices and principles operating behind the scenes— then this option is for you. We offer two advanced programs during the Art of Mentoring week for returning adults to dive deeper into nature connection, mentoring, and earth skills. Participants in these programs do have some interaction with the 1st-Year participants.